A very important piece in the serious prepper’s survival kit is the flashlight. No one should go without one. If SHTF at some point or another, any old flashlight will do if a survival flashlight is not in reach… but nothing can compete with a professional, state of the art lighting gadget that’s been designed specifically for such occasions. These survival flashlights, also known as tactical flashlights are superior to a normal flashlight in both battery life and durability. Most of them come with new and improved LED lighting systems and extremely powerful batteries (rechargeable batteries) that will outlast regular flashlights; there’s is hardly any competition there. Because they’re meant for usage in extreme situations, they are built to be extremely tough and robust: they’ll withstand shocks, they’re waterproof (most of them are) and will deteriorate slowly (if at all) even in extreme climates. And the term “survival” applies in more ways than you can imagine; because they’re so sturdy and tough, made up from strong alloys, they can be used as a self defense clubs in case you’ll be forced to protect yourself. One hit over the head and, ironically, it’s lights out! There’s great variety on the market in the survival flashlight department; products vary in shape, sizes, type of battery (primary or rechargeable), lightning filters and sequences etc. I’m about to show you some of those that I actually got to use and could be an asset to anybody in distress. 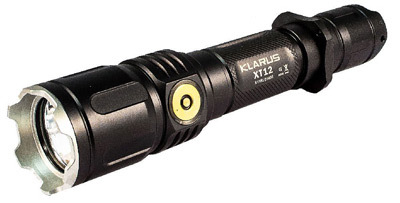 This particular flashlight is still, in my opinion, the best option out there for those who are on a tight budget. It’s the best if you consider the price/quality ratio, considering you can buy it for about $50. It’s 5.7 inches long (1.6 in diameter) and it weighs 5.15oz. The M22 Warrior‘s body is made up of a very durable aluminum which is also used in aircraft manufacture. It used the latest and greatest in LED technology (Cree XM-L2 LED), which can put out about 950 lumens; this is more than enough to give you visibility coverage of about 1000 feet. It has an adjustable brightness level that works on 3 settings and a strobe mode for signaling your position or disorienting attackers. The mode selection and strobe can be turned on / off through a selector unit built into the head of the flashlight. There’s another switch located at the opposite side which controls brightness, but also the auto strobe mode, for quick access. The power source is optional: you can use 2x CR123A batteries units or 1x 18650 battery. At the lowest setting (20 lumens) you get 30 hours of battery time and 1 hour at its highest setting (950 lumens). The SureFire E2D Defender is probably the best self-defense oriented flashlight that I got my hands on. If it’s a white weapon you want that can also light the way from time to time, look no further. It has a crenelated front bezel and tail, all to make it more menacing at to give more angles and edges that can be used in a combat situation. It’s probably the toughest survival flashlight on the market and will take quite a bit of striking force to actually break it; you most probably won’t. If you hit hard and precisely enough, it will stop any attacker in its tracks, be it man or animal. We got the self-defense part covered and we can all agree the SureFire E2D Defender is the force to be reckoned with. If you expect it to be less efficient as a flashlight than it is as a weapon, you’d be wrong because it’s actually pretty good. It has a 2 settings mode: the full power mode will have it working at 200 lumens and will deplete the battery in about 2 hours. The ultra power-saving mode will get it down to 5 lumens, but it will keep battery life for up to 76 hours. It measures 5.4 inches in length and it weighs about 3.7oz. This is a very good choice for those who are looking for a large yet lightweight flashlight, that’s easy to use and carry around. It’s 2.5 inches long, 1.6 inches in diameter and despite its size, it weighs about 1.6oz without battery. It has 3 adjustable brightness settings and it also has an SOS lightning mode, which is perfect for signaling for help. At its highest setting of 120 lumens, it will deplete the battery in about an hour and a half. But if you let it run on power saving mode, its setting of 3 lumens will keep the battery lasting for about 55 hours. And all this can be achieved with a simple AA battery. The power saving mode of 3 lumens is not bright enough for visibility over long distances; you’ll only be able to walk without tripping over anything in the dark. I love this one. This thing is built like a tank, super bright (up to 930 lumens), waterproof to 2 meters, has a strobe mode to disorient an enemy in darkness, and comes with a magnetic connector that enables it to be charged via USB – using the cable supplied. Note that this is a non-standard cable so don’t lose it (or get a spare) otherwise you won’t be able to charge the flashlight. Summary: Choosing your personal flashlight is no easy thing and you should do it by the book. Consider the possibilities, scout the market thoroughly and make the right decision. Of course, you can have more than one, just to play it safe. 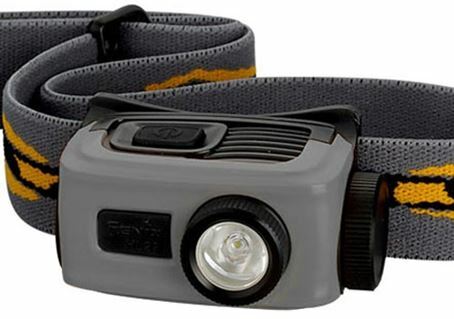 When comes to survival flashlights, the prices may vary from $15 to even $400. A serious prepper should not be without one of the best radios in his personal survival kit. And this is because when modern society fails and crumbles (and our means of communications will be amongst the first to go) or if you simply find yourself stranded, you’ll need to keep in touch with the latest news. Information will be vital for your very existence in such a scenario, and your very own survival radio device will get the job done. So whether hostile armed forces are marching in towards your location or whether a natural disaster is heading your way, you’ll hear it all and have enough time to take whatever precautions are necessary. 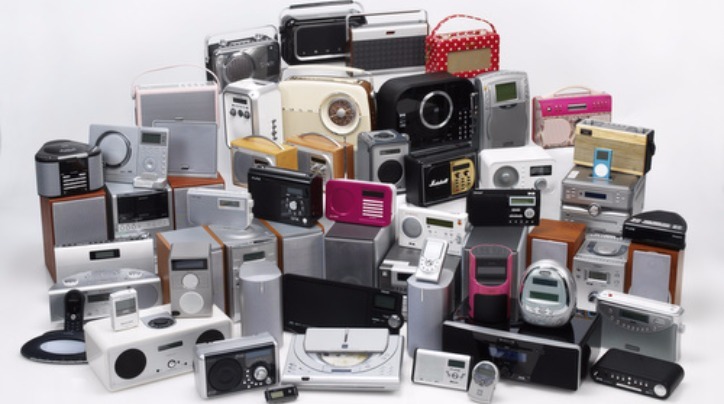 Choosing a radio for an SHTF situation won’t be as easy as choosing one for everyday life. These tiny gadgets can be very complex, but their complexity is a plus if anything. You can have radios that are set to pick up certain wavelengths that transmit the status of natural disasters. Some support multiple power sources, some can charge your small appliances (phones, etc.) and others have a crank system that will allow them to work when there is no electricity. Here are some of the best choices that are available on the market. 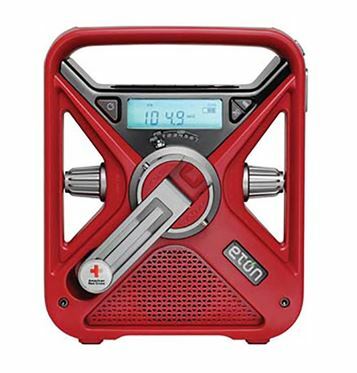 The American Red Cross FRX3 With Built-In Smartphone Charger is a radio made to work indefinitely, despite the fact that there might be no electrical power running through the plugs anymore. Of course, it does have the capability to stay plugged in, but when the plugs fail to deliver, you can use the crankshaft to power up its internal NiMH battery. And if your hand gets tired, you can just point it towards a strong enough light source and the solar panel will do the rest. It’s not just a radio, it’s an intricate device that gets AM / FM bands, all the NOAA (National Weather Service) bands, has a flashlight attached and a USB port to charge up other devices. If you’re the type of person that often losses things, you’ll be happy to know that the Red Cross FRX3 is very hard to misplace, as it has a glow-in-the-dark locator and a flashing red beacon. 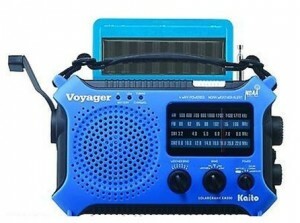 The Kaito Electronics Inc. KA500BLK Voyager is a radio that is very light, well built and comes with many gadgets that can prove very useful in all sorts of situations. It has many choices when it comes to power sources (AC, Battery, computer, hand crank and solar), ensuring its autonomy in all sorts of environments. The solar panel is situated at the top of the device and it’s adjustable at a 180° angle. This feature is very convenient, as you won’t have to turn the whole device towards light sources. 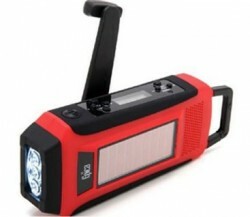 But its strongest feature by far is the array of lightning options you get with this radio device: a flashlight, a red strobe and if these weren’t enough, it also has 5 LEDs for reading light. It gets all sorts of wavelengths (even shortwave broadcasts). And for those of you for whom esthetics matter just as much as anything else, the radio comes in black, red, blue, green or yellow. 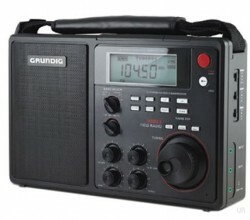 The Grundig S450DLX is an excellent digital radio device, very strong and reliable. It’s very good especially when it comes to shortwave signals. It has a preset channel function that will allow you to preset your favorite radio channels and to access them with the push of the button; you get 50 slots for preset channels (10 per each band). The large LCD display is clear and easy to read and the knobs work perfectly (both the normal tuning and fine-tuning). It receives a high-quality signal, with very little background noise, mainly thanks to its excellent anti-interference. And if somehow you’re still having trouble getting a clear signal, you can attach an external antenna. Aaa power source, it uses DC IN (9V) or 6 D batteries. The Epica Emergency Solar Hand Crank Digital Radio is a radio similar to the model used by the Red Cross, except theirs is smaller. Personally, I’m having doubts whether this is a radio or a flashlight first, as the 3 LED lights fitted on this device are very powerful. As power sources, the internal batteries can be charged by USB, hand crank or through the solar panel. The display is easy to read and the radio picks both AM / FM bands, as well as all 7 NOAA weather bands. Most of the device is encased in a rubber-like housing, which acts as a shock absorbent and also waterproofs the circuits. Staying in touch with the world is a must for all of us. But a simple radio just won’t do. As you can see, there are plenty of choices out there for preppers when it comes to survival radios. And there are plenty more models to check out in order to find the “perfect fit” for you. But get your very own radio, and fast. You’ll never know what’s going to happen next. If it finally happens and the proverbial “stuff hits the fan,” it’s probably going to be bad. Say “goodbye” to fully stocked shelves at the grocery store, readily available medical care, and just about every other modern comfort you can think of. Everything, as we know it today, will change in the blink of an eye. I’m not saying that overnight our society will be transformed into a post-apocalyptic scenario like in Mad Max where we all become War Boys scouring the wastelands looking for fuel and supplies while screaming, “For Valhalla!” I mean… it might… but let’s not get carried away with fantasy. I’m just saying it’s not going to be pretty, and preparation will be key if everything comes crashing down. As in most apocalyptic movies there are usually three crucial things that every person needs to survive in a catastrophe: food, medical supplies, and fuel. I’m assuming most people are already aware of the need to stockpile food and medical supplies, but fuel is often overlooked. Many people are unaware of the need to store fuel. Not just for the family van, but for heat, cooking, electricity, and of course transportation. When I say fuel storage, I am not just talking about gasoline. We also have to consider kerosene for heating, propane and butane for cooking, and diesel and gasoline for generators and transportation. 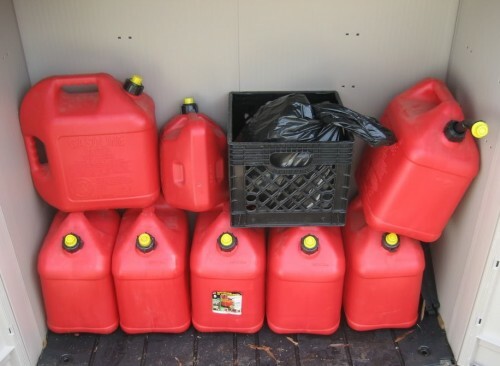 Kerosene should be stored in a container that is approved for this specific fuel. I’m sure you’ve seen the different colored gas cans in the hardware stores. There is a reason for the different colors; it isn’t just to make them look pretty. Blue is the color container that is earmarked just for Kerosene. Therefore, if you need a storage container for this fuel, you will need to purchase a blue-colored container. As with most fuels Kerosene will start to degrade after about three months of normal storage. This degradation can be postponed though by following a few guidelines. First, when filling the container leave a little air in the top for fuel expansion from changes in temperature. Always avoid using open containers. An open container can lead to water contamination and oxidation resulting in bad or poor performing fuel. You always want to store Kerosene in a cool and dry location. The use of fuel additives can also greatly extend the life of Kerosene. A fuel stabilizer such as PRI-D will extend the life of this fuel from several months to even years if the fuel is re-treated with a fuel stabilizer periodically. How do you store Propane and Butane? Aren’t pressurized containers dangerous? They can be very dangerous if you don’t know how to store them. Propane should always be stored in a dry and well-ventilated area, preferably in a storage shed located away from residential areas. Never store propane containers in an area where there may be a source of ignition such as garages or a well/pump house. You also want to be sure that propane and butane storage containers are not kept in any areas that may cause the container to rust. Butane specifically requires a cool and dry storage location, but it must also be stored indoors at all times and never placed in direct sunlight for any length of time. Be sure to watch for possible ignition sources with Butane such as electrical outlets, stoves, and other heat sources. Improper storage of these pressurized containers may result in an explosion, a runaway canister, or a dangerous gas leak – any of which could potentially be fatal. Probably the most commonly used fuels we need are gasoline and diesel. It can be difficult to determine how much of these fuels you should store. Usage factor is determined on an individual basis. A single person may not need as much gasoline as someone with a family of six. I can get buy on a relatively small generator to power what I need, but someone with a large family may need a lot of gasoline or diesel to power a larger generator to meet their needs. Storage of gasoline and diesel is very similar to that of kerosene. They must be stored in a location that is dry and cool to maximize the storage life. Remember, it is vitally important to keep condensation away from any fuel you are storing. Water and air don’t play well with stored fuels. Also, don’t forget to store gas and diesel in their appropriately colored containers. Red is for gasoline and yellow is for Diesel. Gasoline can normally be stored for up to three months before it begins to break down and lose its effectiveness. Diesel can typically be stored for up to six months. As with kerosene, gasoline and diesel can benefit from the addition of a fuel stabilizer. Fuel stabilizers such as STA-BIL Storage and STA-BIL Diesel can keep fuel fresh and ready for use for an extended period of time. Unfortunately, we can’t keep gas and diesel fresh indefinitely. The best way to keep a fresh supply of fuel is to use what we have stored when it is close to going bad and then replenish our stock. With proper rotation of stored fuel and proper storage techniques we can easily be prepared for just about any situation. Alex Vanover is an auto industry professional and avidly writes about the advancements and new technologies in today’s automotive industry. He is also the purveyor of Motorcycle Trading Post. In his spare time, he enjoys reading, first-person shooter video games, and riding his Harley Davidson.